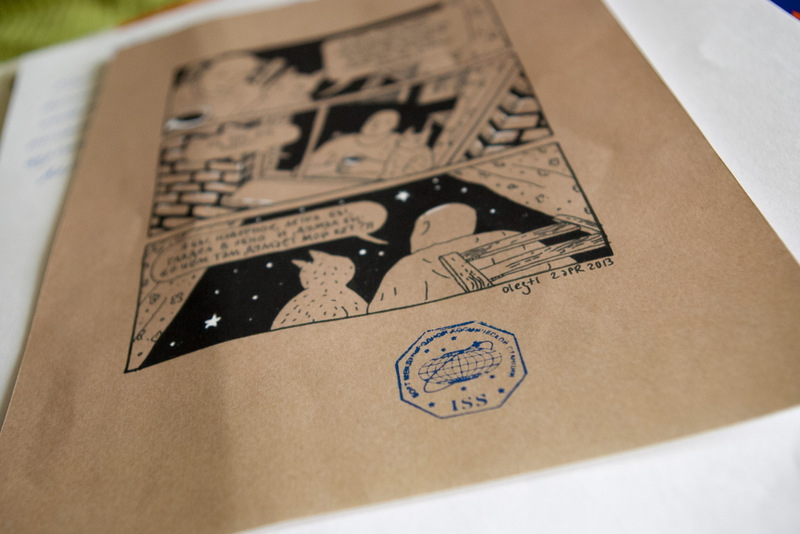 Oleg draws a series of comics called “Cat”. He started the strip while he was working in Moscow, Russia. The “Cat” is amazingly popular in Russia: several heavy volumes of “Cat” comics have been published and invariably sold out. The English version of the strip is available as an iPad app “iCat”. 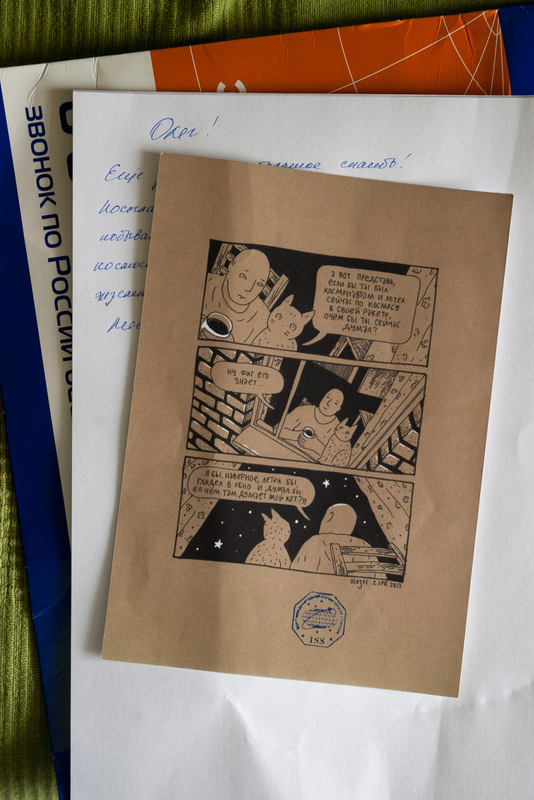 Exactly a year ago Oleg drew a strip about flying to space and mailed it to one of his fan friends in Moscow who liked it a lot. In fact, the friend passed the strip on to Sergey Ryazansky, a Russian cosmonaut who flew to the ISS last year, and served as a Flight Engineer on Expedition 37 and Expedition 38 before returning to Earth aboard the Soyuz on March 11, 2014. Sergey took the strip with him to space, and then brought it back with him in the Soyuz TMA-10M on March 11. Oleg has received his strip back in the mail today! 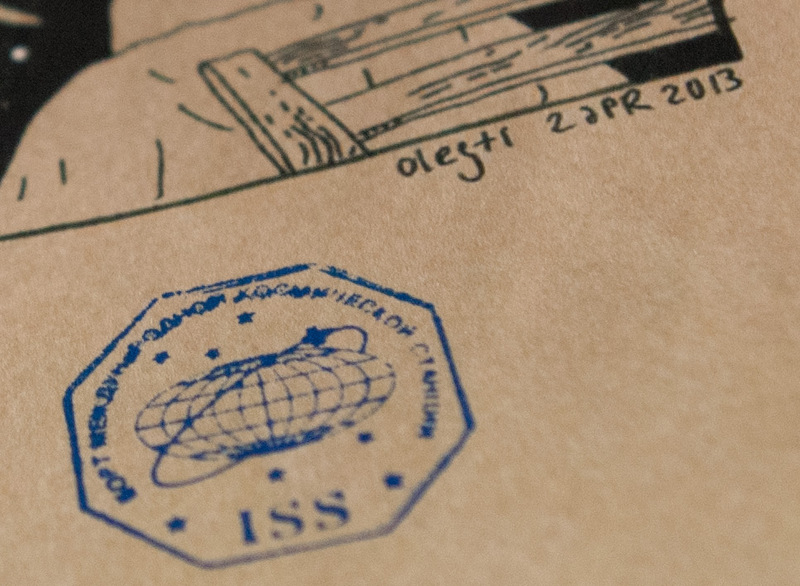 As far as everyone involved is concerned, this is the first hand-drawn original comic strip in the history of human kind that flew to space, resided on the International Space Station for six months, and returned back to Earth. Congratulations, Oleg! That officially makes Rukuku visual design truly heavenly and super highly technological. Sky is no longer the limit.